Get the latest news and industry insights from Micron Products delivered straight to your inbox. The plastic injection molding process is extremely complex with (quite literally) thousands of moving parts. As a manufacturing engineer, it’s not critical for you to know every finite detail of mold-closing mechanisms or the difference between every polymeric substance used in injection molding—but understanding the following 10 terms will make a conversation with a potential plastic manufacturing partner much simpler. In injection molding, precision machining refers to the process by which an injection mold is created with very narrow part tolerances. Creating a snug mold with a tolerance of +/- .0005” keeps the liquid plastic from flashing (e.g. seeping into crevices and ruining the final part). 3D printing is an additive manufacturing process that deposits layers upon layers of material to build up a part. While 3D printing has become mainstream, it still can’t compete with the speed or sheer output of injection molding. However, it does play an important role in the injection molding process, and is often used to prototype a design concept so customers understand what their finished product will look like. 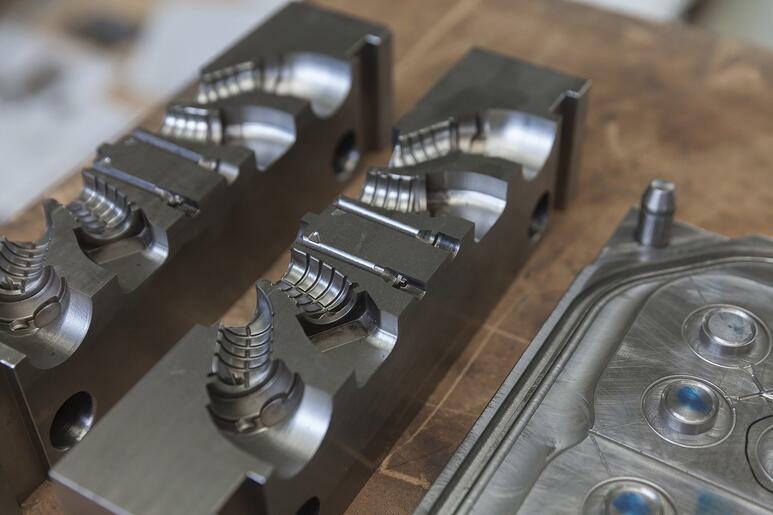 Rapid tooling describes the process of quickly creating a mold with a 3D printer or more traditional machining methods. The issue with rapid tooling lies in part accuracies and tolerances. While a 3D printer can create a mold accurate enough to produce a close replica of a part, the mold won’t have the tight tolerance needed to create hundreds of thousands (or millions) of perfectly shaped plastic parts. To create a thermoset part, cold material is shot into an extremely hot injection mold. This process cures the part so it can never melt again. This heat resistance is the primary function of thermoset material (most often silicone), but thermoset materials are unable to be recycled. To create a thermoplastic part, plastic material is melted and shot into an injection mold. Once this part cools, the mold opens and the part drops out. Thermoplastics like styrene and polycarbonate can withstand warm or even hot conditions—but at certain temperatures they will eventually melt again, and thus are able to be recycled. Transfer molding involves placing a cold, putty-like material inside a cavity in an injection mold. Once the mold is closed, the machine forces the cold material into the hot mold cavity. This transference of the cool material into the hot cavity causes the material to disperse quickly. Once it has cooled, the mold is opened and the part is removed. Clean room molding is the process of creating plastic parts in a special room optimized to reduce the risk of contamination by dust or other particles. Clean rooms are used for injection molding projects that require a sterile environment, like medical equipment. The room is devoid of any fibrous or corrugated material, uses only electric machines, and filters air through positive airflow to maintain a certain level of cleanliness. There are two types of plastic injection molding machines: Horizontal and vertical. In horizontal molding machines, the mold clamps horizontally. Once the plastic part is created and the mold opens, the part drops into a bin and is taken away on a conveyer belt. Or, if the part is sensitive and can’t be dropped, a robot removes it from the mold. Vertical molds lie flat so the part doesn’t fall out once the mold is opened. Because of this, it must be removed by hand or by robot. The advantage to vertical molding is that parts can easily be added into the mold. For instance, if you want to add a round washer to your plastic part, simply insert the washer and close the mold—because of gravity, the part stays in place. Two-shot molding or overmolding are processes used to create parts that require two different kinds of plastic—like a toothbrush or a computer mouse. In two-shot molding, the more rigid of the two materials fills the mold cavity. Then the top of the mold shifts and the second, more pliable material is injected. In overmolding, the rigid material is injected into a mold cavity, then removed after it has cooled and put into a separate mold, where the second, more pliable material is added. The primary difference between these two molding techniques is cost, as overmolding takes twice as long as two-shot molding. Questions about your injection molding project? Copyright © 2017 Micron Products INC. All rights reserved.